Having started our Sunday evening with negronis, we exercised some self-control and only drank half a bottle of blackberry wine. 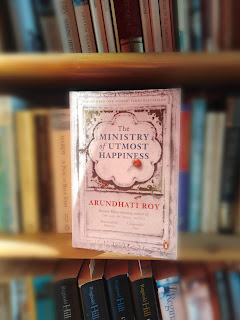 According to my step-counter, I had had a sedentary day (fewer than 3,000 steps) and this was because I spent the morning reading The Ministry of Utmost Happiness by Arundhati Roy - trying to get it finished in time for Book Group. Therefore, I could not justify having additional wine due to an active and exhausting day. The blackberry was as good as ever and accompanied a slow-cooked lamb stew. I didn't get a look-in for the remainder of the bottle. Claire had a glass in the garden to celebrate her first Monday off work and then finished it on Tuesday whilst I was out playing Glinka trios with Madeleine.